Western Digital subsidiary HGST has announced that it has started shipping 8TB Ultrastar He8 HDDs and begun sampling 10TB capacity drives to add to the range. These drives are the second generation Helium filled devices from HGST. Last November it managed to produce 6TB drives with its first generation technology. HGST claims that its Helium filled drives are the best choice for high-capacity, high-reliability and performance. 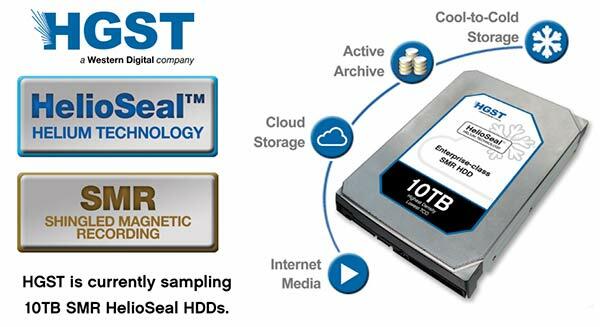 Its hermetically sealed 'HelioSeal' technology will thus be the cornerstone of all future high capacity HDDs coming from the company. The use of the inert gas is said to bring additional benefits of "significantly lowering power consumption" and cooling requirements. However Seagate beat it to the punch by managing to produce an 8TB hard drive last month; "Seagate scoffs at Helium," reported ComputerWorld at the time. Seagate still uses air within its drives but thanks to shingled magnetic recording (SMR) technology it is expected to create drives of capacities approaching 20TB by 2020. The 'shingled' term refers to how data tracks overlap on a platter like shingles on a roof. That helps boost bit density. Seagate still has the option of using a gas other than just air in the future. Back to HGST's new drives and we are told that the new He8 HDDs are available now in 6TB and 8TB capacities. Putting a number to its power saving claims HGST says that the 8TB HDD delivers 33 per cent more capacity with a 23 per cent lower power consumption. HGST's 10TB drives harness both Helium and SMR (like Seagate) to reach their 10TB capacities. The technologies are complementary and additive. While the 10TB He8 drives aren't generally available right now the company is sampling them with clients. In other news HGZT announced its NVMe-compliant Ultrastar SN100 PCIe SSD series. These will be available in capacities up to 3.2TB. You can read more about these devices here. I take it those are N54Ls? What sort of setup are you running on them? Are they RAID? What sort of parity and useable space do you get? I'm still considering using one of mine as a NAS, but keep holding off on drives. The WD 4TBs are looking like good value at the moment, if the Miscroserver supports them. Any news on 2.5“ drives that have a capacity greater than 2tb? I’m looking at a ITX server in raid with 2.5” drives which are cooler and significantly less power hungry but can’t find any greater than 2tb? Just give up on HDD's already. SSD's are already far denser than HDD's, which apart from price used to be their one advantage.